I think my favorite stops of the entire trip were Juneau and Scagway. I've been to both of these cities multiple times, but really got to see and experience some new things this time around. The Mendenhall Glacier was the big event for Juneau. Just a short 15 minute bus ride out of town, it was one of the most amazing sights of the entire trip. The immense amount of rain that the area had seen prevented us from getting as close as usual, but the sheer size of the glacier was still impressive. After touring the museum and watching the video, we started on one of the park trails. While we were optimistic about the three mile loop, steady rain and a lack of appropriate gear convinced us to turn around about halfway through. There were several markers to indicate where the glacier extended to in the past. The glacier has been retreating from the area since the late 1700s. After our hike, we were pretty eager to find some food, preferably in a dry spot. Luckily, one of my favorite restaurants is in downtown Juneau, a small pierogi shop named Pel'meni. These little dumplings are the perfect snack after a long, cold, rainy day. Offered with a variety of toppings, these little guys can be had in potato or beef varieties, 16 for $7. The shop is run by one guy, who was blasting old Beach Boys vinyls way too loud. I loved every minute of it. Dad had also found a killer king crab place last time he was there, and of course, we couldn't pass that up. If you have never had king crab, don't do it, as it'll only ruin every other crab for you in the future. Our next stop was Scagway, a former mining town now turned tourist destination. The city is setup like many downtowns, lined with shops, restaurants, and museums. We'd done all of that before and we wanted something different. We picked up some trail maps from the National Park office and set off for the day. This trail led to an awesome little cove covered in sea grass, algae, and muscles. We relaxed here for about an hour just taking in the views. Our last day was a day at sea, but the ship did take us to see the Hubbard Glacier. While the Mendenhall Glacier was certainly impressive, it doesn't hold a candle to the Hubbard. The captain was able to take us to the minimum legal distance, a half-mile away, and it was mind-blowing. The finale of the trip was a train ride from our final stop, Seward, to the Anchorage airport. The tracks largely followed the Seward Highway, and offered some classic Alaska vistas. Thanks again for following along! If you can, find a way to get to Alaska. You won't regret it. When I first went to Alaska in 2002, I fell in love with the incredible landscape. My parents took me on a cruise through the Inside Passage, and had the chance to see mountain ranges, glaciers, and wildlife like I'd never witnessed before. Returning again, fifteen years later, I'm still impressed. We took the same route as before, adding in a couple of extra stops, but I had the chance to do some hiking at each stop and actually get a better feel of the land. 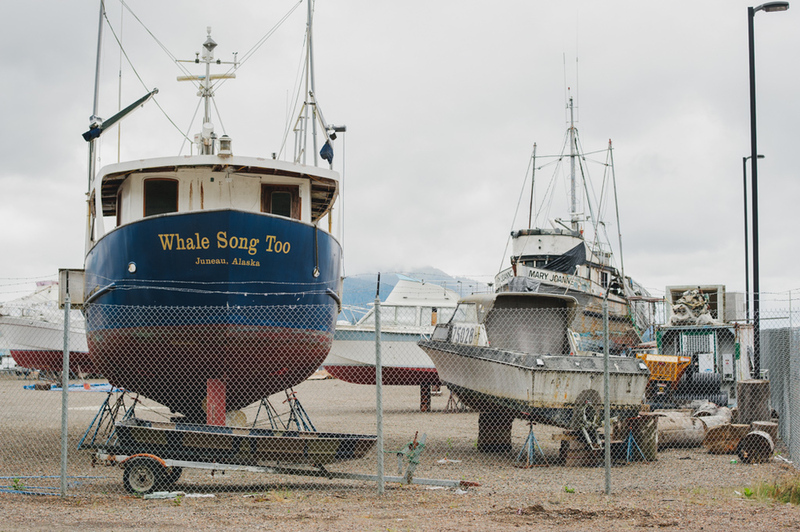 Obviously, this is still a scratching of the surface when it comes to the Alaska wilderness, and Aimee and I are excited to back, but we are stoked with what were were able to see within walking distance from the ports. Leaving out of Vancouver, the blue skies of that evening would be the last of our trip. The weather of Alaska summers is unpredictable, and the remainder of the week was overcast. Facing east, the cloud cover had already set in. The sunset was an awesome gift to start the week off. Thanks to the four hour time difference, I woke up at 4:45am on Friday morning and went out for the sunrise. I figured I'd be the only one up, but I was surprised to find a few other folks were out as well. Our first stop was Ketchikan. Dad had booked us a fishing charter, so we were up and off the ship by 6:30a to meet our guide, Ryan, who owned Best Weigh Guide Service and his boat, Outcast. 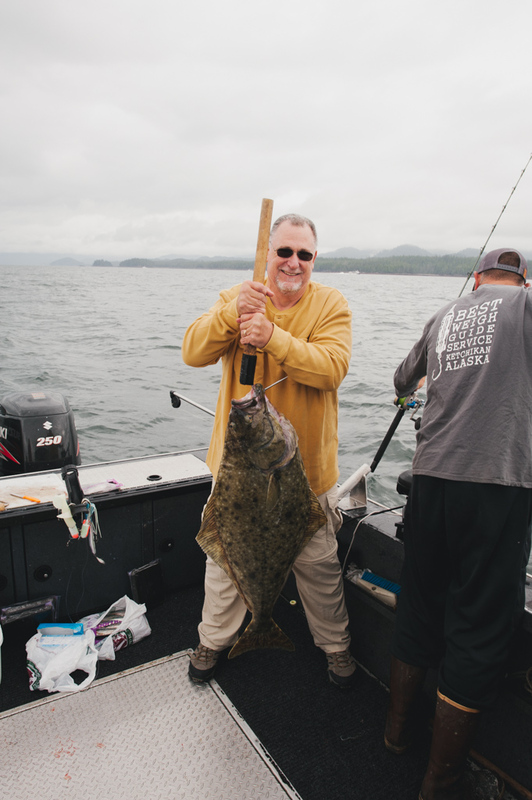 We were primarily fishing for halibut and salmon, but ending up catching a nice variety. At the end of the day we had four halibut, eight rock fish, five cod, and six salmon. Dad is shipping the meat back to us, so we'll be enjoying fresh fish for awhile. As we were headed back, Ryan spotted some bald eagles and said "Watch this. And get your camera ready." He gutted a salmon and began to whistle. Our second stop was at Icy Strait Point, a port owned by the Huna Totem Corporation (a native run organization). Centered around a restored salmon cannery a mile outside of Hoonah, Ice Strait Point was probably the most "touristy" location, but it really well done. There was a museum, a short nature trail, and a few restaurants. We decided to walk the 1.5 miles down to Hoonah after the short nature trail. It is a small town, seemingly still rather new to being a tourist destination. I'll stop here and pick up Juneau, the Mendenhall Glacier, Scagway, and more on the next post! Thanks for reading!